With so many great restaurants in Frederick, MD it can be a bit overwhelming to figure out where to eat. 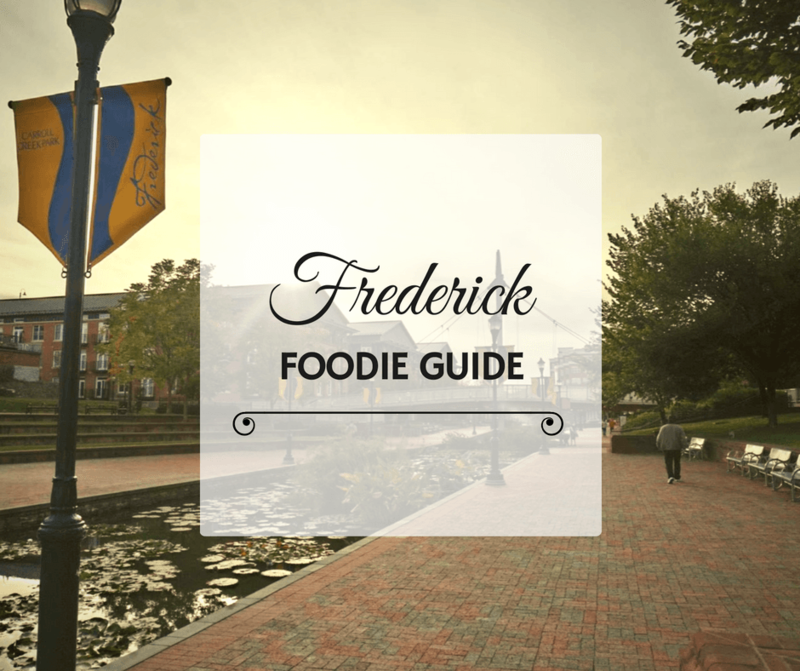 However, with this foodie guide, we narrow down the best places to eat in Frederick so you can enjoy your trip to the max! Vacation calories don’t count, right? We hope not, because Frederick has so many great places to eat, snack, and drink. There are over 30 restaurants in its historic downtown district, making it a foodie’s paradise. Below you’ll find what we consider to be the best places to eat in Frederick. The Wine Kitchen is considered one of the best restaurants in downtown Frederick. We loved this restaurant before we had even walked in. It’s right on Carroll Creek, a mile long park that has pedestrian paths, public art, and charming bridges. The views are nice outside, but the decor inside is great too and it has a very simple and modern feel to it. Once we were seated, our waitress Laura was absolutely fantastic. She was so attentive and knew the menu inside and out. She also helped us decide what to order (it’s hard when everything on the menu sounds amazing!). The first thing we ordered was a flight of wine: Traminette, Moscato, and Riesling. As a starter we had the home-made pappardelle. The pasta was cooked perfectly, but the best parts of the dish were the thick chunks of bacon and the sauce. For our main dish, we chose to have duck and were quite pleased with our selection. The chef was inspired by African flavors so Ethiopian spices were used to prepare the meal; those spices made the dish absolutely delightful and the flavors incredible! The duck itself was cooked perfectly and came with onions, pickled chips, and a peach vinaigrette. Finally, for dessert, we had the banana chocolate pavé. This small chocolate cake was paired perfectly with banana ice cream and a caramelized banana. We walked (slowly) out of The Wine Kitchen with big smiles on our faces and we know that you will too. We had read about Zoe’s when we were first researching where to eat in Frederick. All of the reviews were great, so of course we made a beeline straight for it. The heavenly smell of chocolate gets your mouth drooling as soon as you walk through the door! Zoe’s is a family run company that makes everything fresh, using local and sustainable products. We walked back and forth, admiring all of the flavor combinations and cute packaging. Everything looked so perfect! From chocolate bars to hot chocolate drink mixes and from cacao spice rubs to chocolate covered chickpeas, Zoe’s Chocolate Co. has it all! If you’re a fan of old school soda pop, you’ll love the North Market Pop Shop! They have over 400 flavors, most of which are cane-sugar sweetened and in glass bottles. They also have a big selection of root beers and ice cream. And just so you know, you can have a float made with any combination of soda and ice cream! One morning, we needed a quick breakfast before we headed off to visit Monocacy National Battlefield. We had randomly asked locals for their recommendations and they all suggested Beans & Bagels. You can enjoy a sit down breakfast as well, but what we loved was that you could order from a huge selection of breakfast sandwiches and take them to-go. We ordered an egg, cheese, and bacon sandwich on a plain bagel and coffee. And even though they’re Steelers fans… we’d love to go back and try out some of their pastries. All of the pies and muffins on display looked really appetizing. Also along Carroll Creek, Doner Bistro is the perfect place to stop after taking a stroll through the park. There is both outside and inside seating, as well as a great menu that includes typical German food like döners, schnitzel, and bratwurst. And beer. Can’t forget the beer. We were pretty excited about visiting Döner Bistro since we lived in Germany for three years and used to eat döners pretty regularly. As soon as we took our first bite, it brought back so many wonderful memories! Don’t you just love when food does that? We loved the döner and the fries (pommes) so much that we’d go back in a heartbeat. This is probably the cutest shop in all of Frederick! It’s warm, inviting, and it smells amazing. Now, to be completely honest, we’re not really that into tea. But one of my best friends is and we recently tried some herbal kombucha on a food tour in West Palm Beach, so it’s growing on us. We loved that we could sample some of their teas and how knowledgeable the staff was. They were very patient with our many questions and helped us pick out the perfect chai tea. We also learned a bit about tea while we were there, since we didn’t know that there were so many different varieties (like fruit teas!). Voila seems like the perfect place for both tea newbies and tea connoisseurs. Next visit try Vintage in New Market. Great cocktails and interesting and varied menu with a variety of items and prices. I must admit, I hadn’t even heard of Frederick, Maryland, but it looks like you found some great spots. Any town that has designated chocolate and tea shops is okay by me! I’ve always wanted to visit Frederick as I’d see the sign for the exit each time I drove to Virginia Beach (which was often). I’ve always been attracted by the history, but now it looks as though I’ll have to check it out for the food. As you know, I was recently in Frederick, too. I ate brunch at Isabella’s Taverna & Tapas Bar in the cute historic downtown before going wine tasting in that region. I actually lived in the Washington, D.C., area for 3.5 years, and this was my first time visiting Frederick! Since one of my good friends lives downtown there, I’m sure I’ll be visiting Frederick again on my future visits to the D.C. area. She and I will have to check out some of these restaurants next time! Oh that’s awesome! There are so many places to visit there. I know you and your friend will enjoy your time there. The Wine Kitchen sounds so good. I love the thought of the African flavor combinations. 😉 I have never been to that part of the state. Looks nice. All lovely places. But I for one would straight away head towards Zoe’s Chocolate Co.. The chocolates appear tantalizingly tempting. I have not been to Frederick yet, but now I want to go and eat everywhere you ate. I definitely want to try the banana chocolate pavé! Omg, it was so delicious Mindi!! Frederick has some great places. I even went to a Cuban place for lunch a few years ago. You would appreciate that, being from So Fla. Volt is still on my mind as a place to try there. Great list! Zoe’s Chocolate shop seems like something I would love to stop by. The pop shop also seems so cute, as well as the tea place! It’s nice to see a Doner place is the U.S. like the ones they have in Germany… they are so good!! Oh man all of this food looks delicious! I think I would find my chill spot at The Wine Kitchen. I would have to struggle to leave the same weight as I would enter Frederick with! What a great list! I have my nephew there and he is a foodie! I’ll ask him if he has seen all these places or not. I bet not. Great suggestions! I would love to check all of these out. Zoe’s Chocolate Co. and the Pop Shop look amazing and the Wine Kitchen would be right up my alley! I’d love to explore Frederick, Maryland, sometime–I’ve never been! What an eclectic list of foodie establishments, Vicky! The North Market Pop Shop looks especially interesting. I think Jerry and I drove through Frederick a few years ago when we took the Amtrak Auto Train from Florida to Virginia and explored historical sites in the area before driving all the way back home. I’ve been wanting to visit Frederick, it looks so cute and it looks like there are tons of of great places to eat. Take me to that pop shop. Now. What an incredible place with all these vintage brands. I don’t think you could get me out of there again. Haha! I totally understand! There are so many flavors! A walk to a historical city like Frederick is surely interesting. The view from the outside feels like traveling back in time but the feeling inside every restaurant is modern. If I have to choose one I’ll probably pick North Market Pop Shop. The little shop looks quirky and the idea of 400+ varieties of sodas is WOW, where in this world you can find such plenty of choice. I’m a lover of Ice cream too so I would definitely love this place. What an awesome list. The Pop shop and the chocolate place is where you’ll find me. Maryland is going on my to go to list. Great post.